Steven Heydt from Elite Island Resorts came up with a creative promotion that not only aligns investors’ depressed moods to the plus of a vacation in his chain, but also landed them broad media coverage, like this story in the New York Times. We saw this movie last week and it is still on my mind. My favorite this year, and certainly among my all-time favorites. I recommend it to all. 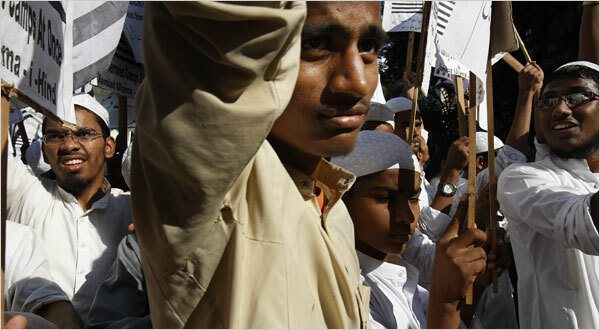 In another development showing a rising tide against pseudo-Islamic terrorists, throngs of Indian Muslims marched to condemn the Mumbai terrorist attacks and dissociate Islam from the actions of the perpetrators. "Muslim leaders have refused to allow the bodies of the nine militants killed in the attacks to be buried in Islamic cemeteries, saying the men were not true Muslims." I just got this book for my wife (eh, well, and for me). Paul Simon is a real genius. I strongly recommend this book. Here is another good article on the misaligned incentives that came about when Wall Street went public.